During maintenance of cars and motorcycles, it is used for slight oil stains and wiping. When you do not need to use large paper waste, it can be used like a tissue and is useful with less fuzz and tear. This review is about item#40131165. I always use silbon paper, but the price is a bit high so I bought Kimwipe and this one. I felt that it was a little hard and I felt that the plastic lens and mirror would be scratched but there is no problem. I used to wipe off the drops of water after cleaning the glasses and stains, and it was completely clean without any fuzz, so I would like to purchase it again. It is different for those who are familiar with Kimwipe and Kim towel. I find it easy to use because it is often used to wipe the slide glass, but I think its water absorption etc is inferior. 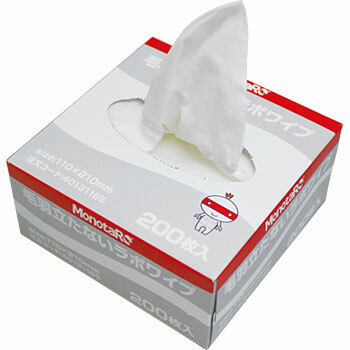 In a nutshell, a strong fluffy tissue. I use it when I want to wipe off oil stains when it is not necessary to put out a large paper waste. It's a little bit firm, so it's better to use it by hand. It is big enough to enter a tool bag in a half-size box of tissue paper. I can endure the size of the wipe, but because the thickness was thin, it is necessary to use properly in the right place. I like the most fluffy paper towels I've ever used. The size is smaller than ordinary paper towels, it is good not to get in the way. Suction is also good, it is used for wiping off paint because it is not soluble in water and alcohol. Used before and after use of a degassing sealer for food. Clean the main part by including disinfecting liquid. As the product name suggests it is not fluffy and easy to use. Although it is not super precision, such as washing the gear of the car, I think that this wipe is enough if wiping the precision parts. It was a smaller wipe than I expected. I wish it was a little big wipe. But, it was cheap so I am satisfied. Quality is normal. However, compared to Kimwipe, I thought it was a little weak. I do not have to worry about it because it is a cleaning application. It will be a talk at the time of shipment, but there was something like a pink stain in the box. It is a bit disappointing. If you wipe a slightly viscous, rubber type surface material etc with water, small paper scraps may remain. Because there are many cases where nothing remains in Kimwipe, we decide to use it according to the material. Because of this paper quality, it is very easy to use for my purpose. On the other hand, because the package is very hard to use, we have replaced the contents to Tupper etc and used it, but I also thought that there was a resin case with a lid that is easy to take out exclusively. I purchased it because it is cheaper than Kimwipe. Tissue gathers in the hand when it gets wet on fluffy top, it is inconvenient because it is inconvenient to break. Kim wipe is high in everyday life, I feel it is painful because it is more gentle than Kim wipe so I patronize it. I repeat. It is better to hold than the tissue without fuzzing, but feeling somewhat inferior to Kimwipe. Because the price is reasonable correspondingly, it is sufficient performance in the scene currently being used. Although the size of one piece is small, it is rather helpful to handle small parts often. This review is about item#48364076. The paper quality is hard, and the feeling is strong. There are mixed defective paper (?) With many small holes. It is hard to fuzz, but it does not mean it is not at all fluffy. I also took out the vinyl at the outlet right away. It is normal as quality. When "Kimwipe" is searched for items, it is displayed just beside as recommended items so I misunderstood that it is like a montallow brand Kimwipe substitute and tried purchasing it, but it is quite different. There is no stinky feeling like a kimwipe · rough feeling like a paper towel like putting around the sink of the laboratory rather than. This is not particularly dissatisfied because it seems to be used for this. Turn off silicone on this, making the base before painting. Small bike parts are enough. I really appreciate it because it is not fluffy. Antistatic Wrist Strap, "One Touch Wrist"